CAS and LoanBook users can now take advantage of Active Directory user accounts. Users will no longer need to have a separate login credentials for LoanBook connections and transactions. 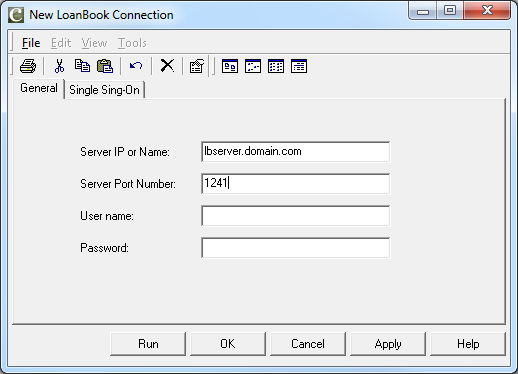 It’s mandatory that the LoanBook Single Sign-On proxy Server (SSOProxy) is running on the same machine as the LoanBook server. Both servers must be listening on the same IP addresses. There are three ways to establish a connection from CAS to LoanBook. The first way is to predefine the connection parameters in the CAS shortcut and use the “Default Connection” options. 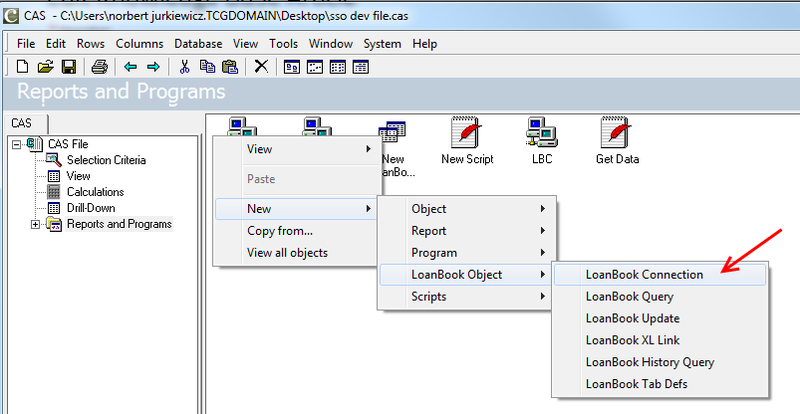 Second is to use CAS “LoanBook Connection” interface objects and the third is to connect via scripting. 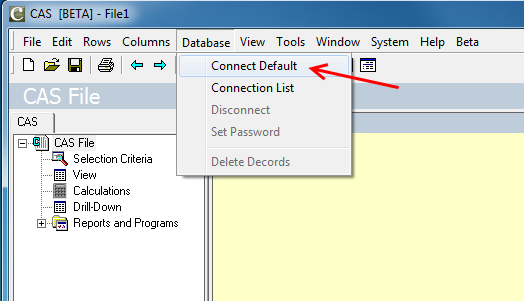 LoanBook/SalesBook or CAS "Default Connection"
The typical CAS startup shortcut contains the path to “dyalort.exe” and the “cas.dws” files. The inifile parameter specifies which registry key will be used. It usually looks like this: "C:\Program Files (x86)\CarlisleGroup\CAS 5.0\dyalogrt.exe" CAS inifile="HKEY_LOCAL_MACHINE\Software\CarlisleGroup\CAS 5.0"
There are additional startup parameters required to start CAS or LoanBook/SalesBook client with the intention of connecting to a LoanBook server using a default connection. LB_IP – The machine name or IP address of the LoanBook server. A machine name is preferable because it’s used to generate a connection SPN. (LB_IP=”lbserver1.domain.local”). if a FQDN is not used, a SPN is not optional. SSO_TimeOut – Amount of time, in seconds, an authentication call can take before an error is thrown. The default is 30 seconds. (SSO_TimeOut=30) The maximum TimeOut allowed is 60 seconds. LoanBook and Salesbook client will automatically logon to the LoanBook server when started with the parameters above. CAS will give the option to use the "Default Connection" menu item. 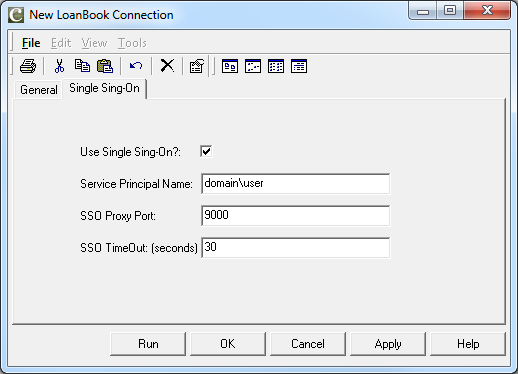 Using LoanBook Connection objects lets the user connect to different LoanBook servers or instances in the same instance of CAS. In order for the objects to be visible in the menu, the LoanBook parameter must be set to 1 in the startup shortcut. These objects allow users to choose LoanBook classic or Kerberos SSO authentication. Create a LoanBook Connection object. Right-Click to get the menu and select "New->LoanBook Object->LoanBook Connection"
Go to the newly created objects properties. Right-Click on the object and select "Properties"
On the "General" tab you must put in the "Server IP or Name" and "Server Port Number" fields. The "User name" and Password" fields are optional when using single sign-on. Go to the "Single Sign-On" tab. This sample script shows how to connect and query a LoanBook server using the new Kerberos single sign-on authentication.